Four of our favorite words come together into one amazing combination of flavor: tropical, pineapple, cheesecake, tart. Put them all together into one dish and something delicious happens! When we think “tropical,” we think warm breezes, cool drinks, and fresh fruit. 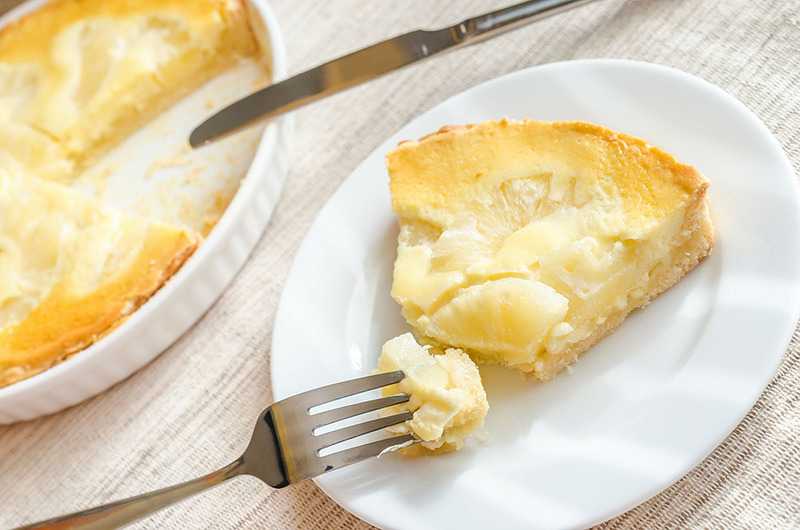 Pineapple and coconut are delicious on their own, but when added to sweet cream cheese and baked in a tart…well, let’s just say it you’ll want more than just one slice! We can’t always jet off on an island adventure, but we can whip up this sweet treat and dream of a tropical paradise. Pineapple adds a citrusy zing, and the reserved juices help to counterbalance the creaminess of the cream cheese. The added coconut ensures a tropical flare, but also adds great texture to each bite. All of this cool and sweet filling sits on top of a flaky crust. When it comes out of the oven, it has a golden crust, with slices of pineapple almost floating at the top. It reminds us of sitting on a beach watching a gorgeous sunset…but it’s a dessert! Serve with ice cream, add a touch of whipped cream or simply serve up a single slice for a taste experience you’ll want to repeat again and again. Roll out pie crust and use it to line a 10-inch tart pan, trimming as necessary. Prick well with a fork and bake blind for around 8 minutes. Beat cream cheese, brown sugar, coconut, coconut extract and egg until light and fluffy. Add a small pinch of salt. Pour mixture into partially baked pastry shell to create a thin, even layer. Add pineapple rings as a topping, cutting in half to fit as necessary. Bake filled pie in the hot oven for around 20 minutes or until filling sets. While the pie is baking, mix pineapple juice with sugar and cornstarch in a small saucepan. Cook over low heat, stirring constantly, to create a glaze. Remove cake from oven and spoon glaze evenly over the surface. Cool pie to room temperature, then refrigerate until completely chilled. Serve and enjoy!